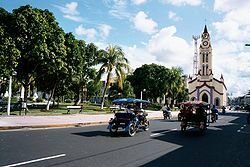 Iquitos is the largest city in the Peruvian rainforest, with a population of 370,962. It is the capital of Loreto Region and Maynas Province. Located on the Amazon River, it is only 106 m (348 ft) above sea level, although it is more than 3,000 km (1,864 mi) from the mouth of the Amazon at Belém (Brazil) on the Atlantic Ocean. It is situated 125 km (78 mi) downstream of the confluence of the Ucayali and Marañón rivers, the two main headwaters of the Amazon River. Iquitos has long been a major port in the Amazon Basin. It is surrounded by three rivers: the Nanay, the Itaya, and the Amazon.